This January marks the 80th year of the King of Rock & Roll’s birth. I, and no doubt many others, certainly wish Elvis lived to see January 8, 2015. He probably does, too. Whether you prefer the pre-Army Elvis (as I do), Movie Elvis, or Vegas Elvis, no one can deny the man’s staying power in pop culture and his profound influence on modern music. Elvis, believe it or not, has also had an influence, at least in some small part, on American cuisine. People outside of the South became more aware of the cuisine of the region, and just about every diner and restaurant – greasy spoon, fancy, or even sushi – in the U.S. has some version of something Elvis themed – usually involving bacon, peanut butter, and/or bananas. 1. White marshmallow fluff bread is a must (i.e. Mrs. Baird’s, Buttercrust, Wonder). Period. 2. A well-speckled banana is best. You don’t want it too green or too black. 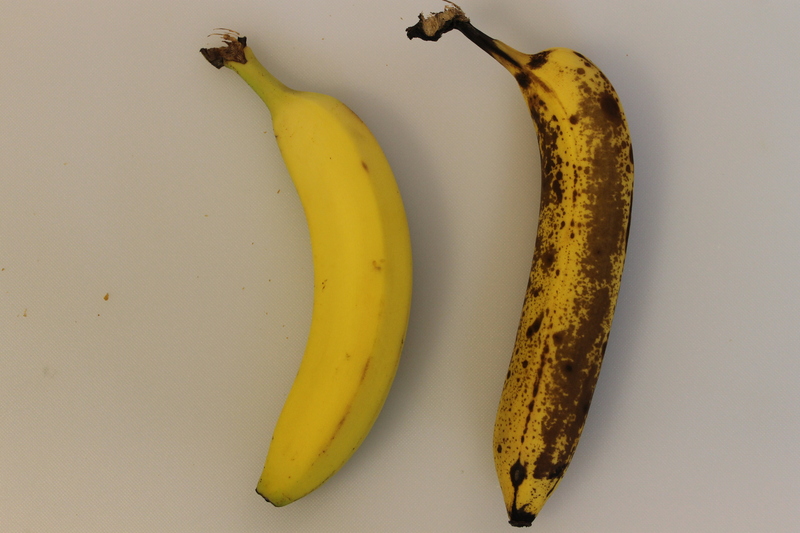 Banana comparison: The left banana is my preferred state of ripeness for eating out-of-hand. In fact, it’s almost too ripe for me at this stage. The one on the right is way too ripe for me to eat, but, it’s perfect for the sandwich. 3. While it appears that Mary used smooth peanut butter in the video, you can use either smooth or crunchy. It’s your preference. 4. She also sliced the bananas. This doesn’t quite match most of the recipes I’ve read, but, if you prefer to slice the banana instead of mashing it, go ahead. 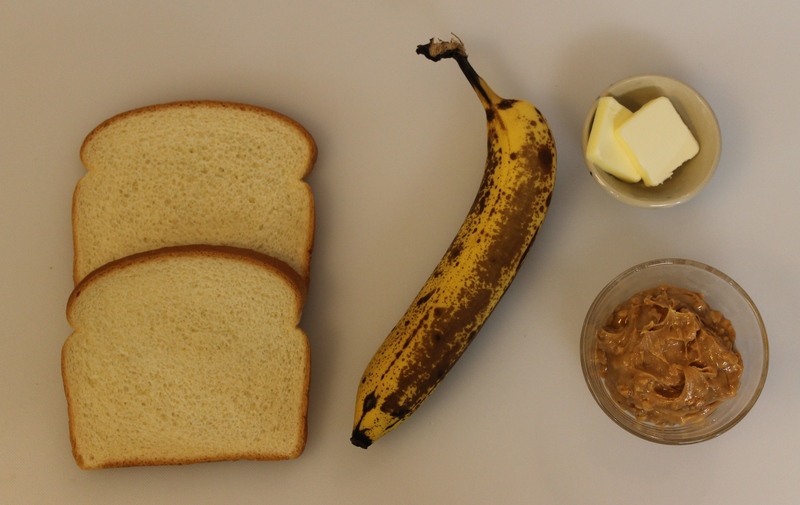 Slicing the bananas will make a far less messy sandwich. 5. Butter. period. That being said, looking at the video, Mary is continuously adding butter to the pan. I simply spread it on the bread. 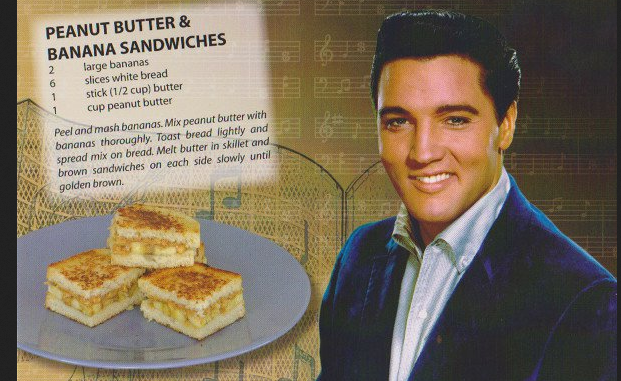 However, if you want to make your sandwich as rich as Elvis liked it, go for it. Just as a reminder. There has never been bacon on this sandwich. Somewhere along the way, someone added it. Not to say it isn’t delicious (because it is), but bacon is not part of the original recipe. Second reminder: This isn’t a sandwich that needs to be or should be healthy. Butter, white bread, and hydrogenated peanut butter (i.e. Peter Pan, Jif) are musts. 1. 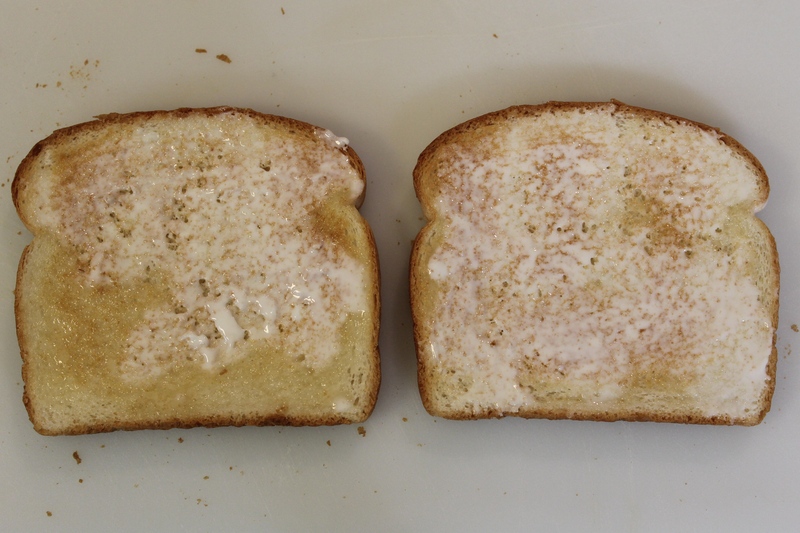 Lightly toast the bread and spread butter on one side of each piece. The buttered toast. Looking at the video, apparently Elvis liked his sandwiches to be fried in about a quarter pound of butter. I love butter, but I just couldn’t do it. This toast is well-buttered, however. 2. On the unbuttered side of the bread, spread peanut butter on one slice. Top with the either sliced or mashed bananas. Place the other slice on top. The peanut butter and banana. 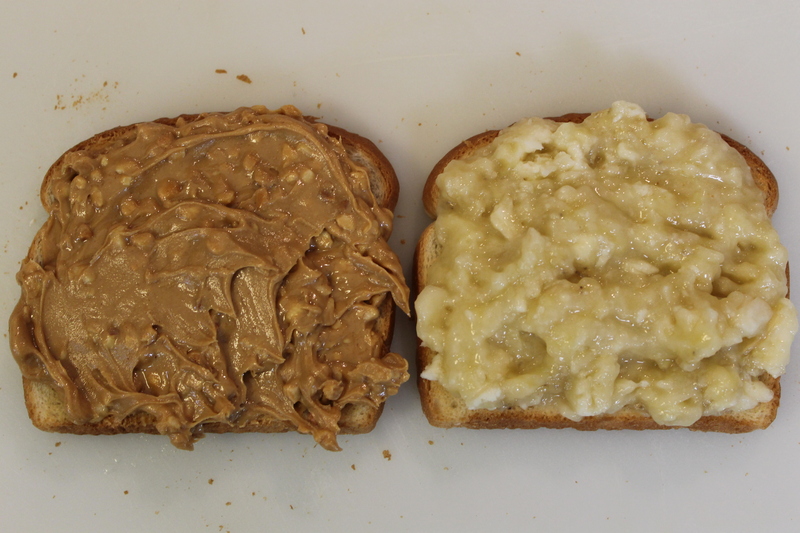 You can spread both on one piece of bread; I just did it this way for illustrative purposes. 3. In a skillet heated over medium heat, place the sandwich and fry on both sides until dark golden brown. Frying the sandwich. 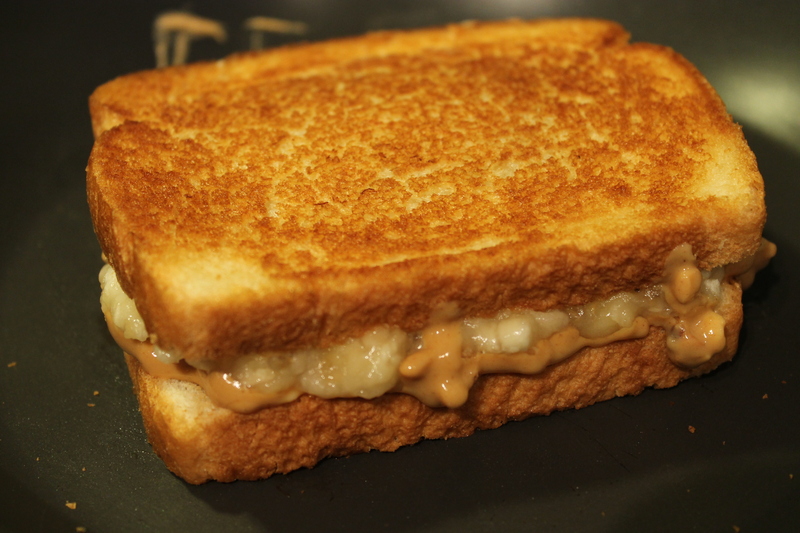 Because the bread was already toasted a bit, you’re basically frying the sandwich to toast the bread further and warm up the peanut butter and banana. Plus, Elvis really liked to have his food well done. 4. Remove the sandwich from the skillet, place it on a plate, cut on the diagonal (that’s the way Mary did it), and serve. 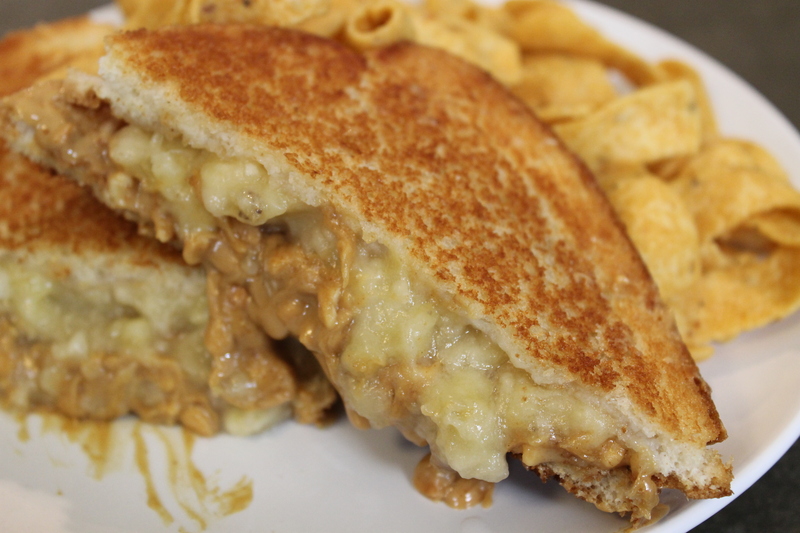 A delicious gooey mess of a sandwich. It will be a whole lot less messy if you use sliced bananas. Also, milk and corn chips are the perfect accompaniments.